We cherish the Guadalest Valley by taking care of it and nurturing it so that you can taste its local products and enjoy every moment. Our products are 100% organic, certified, non-GMO, sourced locally and nationally, as well as free from chemical additives. We combine the creativity of avant-garde cuisine and traditional flavors to serve you amazing dishes. Our restaurant in Guadalest accepts reservations even if you are not staying at the hotel, when booked in advance. If you’re looking for vegetarian options, our restaurant has a number of options that will delight you. The VIVOOD restaurant & Lounge Bar is set in a unique place. Just under 2km from Guadalest, our panoramic restaurant offers you the opportunity to discover the allure of the Guadalest Valley like never before. Every corner of our hotel has been exclusively designed to transport all of our guests to a place for peace, tranquility, and escape in perfect harmony with the surrounding environment. Our restaurant lounge bar is just as spectacular. 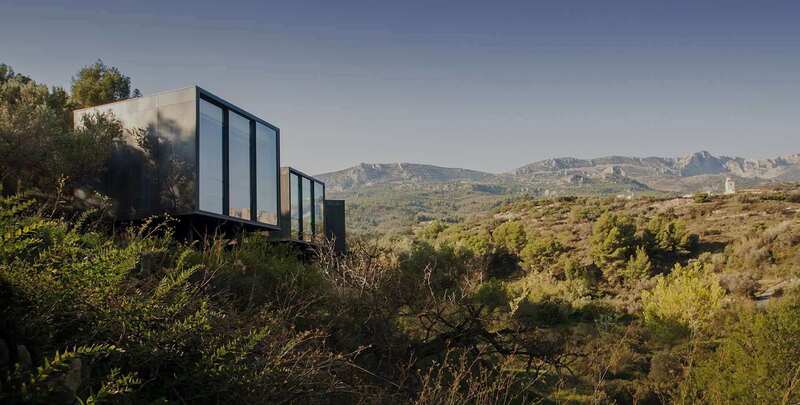 By blending into the landscape with its glass walls and endless terrace views you’ll also be able to breathe in the fresh valley air. Above all, our innovative take on local gastronomy here at the Guadalest restaurant will leave you speechless. Our lounge bar has a modern, yet simple design. It simultaneously respects and flawlessly blends in with the stark natural beauty that defines the Guadalest Valley. Come and enjoy appetizers, lunches, or dinners in any of our spaces. Indulge your palate with favorites from our menu or with daily specials throughout the week. Visitors not staying in the hotel must book in advance. At the Guadalest restaurant we want to help you unwind and relax, and to help you do so, we offer free parking. At VIVOOD we are committed to sustainability and a healthy lifestyle in every way, including in our restaurant and our food. Through these we advocate respect for the environment, culture, and traditions. As a result, our gastronomic offerings are based on using local products from right here in the Guadalest Valley as well as from other nearby towns. We adhere to the Slow Food philosophy. We do this because we believe that local products and flavors from the Guadalest valley deserbe to be tasted, bringing to life the palate of each and every guest. Every day, at VIVOOD we prove that healthy eating can be the same as tasty eating. We serve 100% organic and responsibly sourced products from our organic, certified, nationally-grown meat from animals raised in a natural and sustainable way, to our non-GMO fruits and vegetables, grown without chemicals so they are as beneficial for your health as they are for the environment. Our dishes and our gastronomic menu show our commitment to sustainability and the environment. As a result, we offer culinary creations that bring together traditional flavors and the gastronomic culture of the Guadalest Valley through the innovation and creativity of avant-garde cuisine. We invite hotel guests and visitors alike to discover our exquisite flavors any day of the week. Come to the VIVOOD Landscape Hotel and you’ll discover a new approach to luxurious escape here in Guadalest, where our cuisine will ignite your senses. Sample new and unique flavors while immersed in nature. A countryside hotel that offers guests a place to truly relax. VIVOOD is not only the best place to feel rejuvenated, but also to enjoy our luxurious cuisine. If you want to run away from the daily routine, from the noise, the hurries… this is your place. Soon after your arrival you will feel the smelling of the mountain, the songs of the birds and a soft music that puts you at ease. The environment is simply, amazing. Its infinity pool is a treat for the eyes, Guadalest reservoir in the background, at the end of the valley. It also gets, very softly, the sound of the bell tower of Benimantell church. 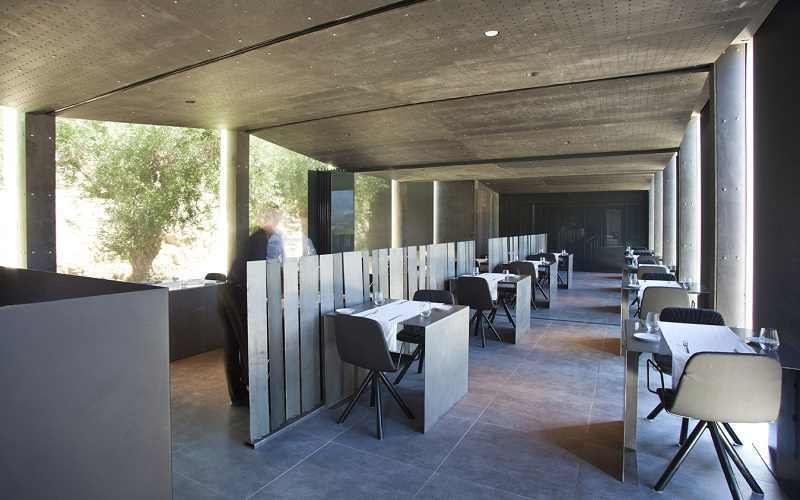 Now that you know what’s on order at the Guadalest Valley restaurant, whether you’re a guest or not, book your table and come for an unforgettable dining experience.